Adquirido, 27 de febrero de 2017,a través de Todocolección a Sirera Serveis Fotogáfics S. L. de Lleida. Según el vendedor y según se puede observar en la fotos el objetivo está en bastantes buenas condiciones, incluye ambas tapas y estuche original. Recibido 2 de marzo, la tapa frontal parece de fabricación propia y el estuche está algo deteriorado, el objetivo sí se ve en muy buen estado y todas las velocidades funcionan correctamente “de oído”. Other characteristics Optical redesign from the earlier version. The filter ring is very thin and exposed, and is easily dented. Some lenses come with alloy rings which stiffen the threads when filters are not attached. Telephoto design, which is more complex than the earlier model. The word ‘Super’ is engraved on the bezel around the front element in red, and the ‘180’ engraving on top of the viewing lens is also red. One example has been reported that does not have the ‘180’ engraving and the shutter is marked ‘Seiko – SLV’. Diferencia de construcción óptica entre el 180 y el 180 Super, este último formado por 5 elementos en 4 grupos frente a los 4 elementos en 3 grupos del anterior. 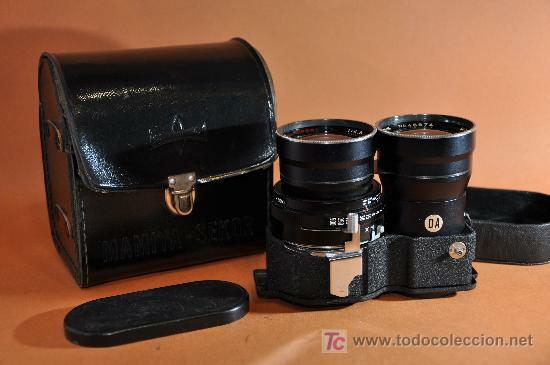 It seems to be generally acknowledged that this particular lens represents the essence of Mamiya´s expertise in optical technology. Therefore it´s called “Super”. Or so we think. I suspect the “Super” suffix was added because the “normal” 180 mm Sekor and the improved version were sold simultaneously for a certain period. Actually the design of the 180 mm Super Sekor isn´t too elaborated, but it is indeed unique and delivers very good sharpness and resolution. As far as I know there has never been a “blue dot” version of this lens, and it has solely been sold with the amber coating. Just like the 65 mm and the 250 mm lenses, the 180 mm Sekor needs a wide diameter front element, expanding the filter thread to 49 mm. As a consequence, the lens barrel is again very thin and delicate and was originally protected with chrome stiffening rings. My 180 mm Sekor Super doesn´t have the reinforcing rings any more, but complete lenses are still reaonably easy to find today. To show an example for the Sekor 180 Super performance I fired a random shot right into the middle of one of my flower borders. Nothing special at all. Kodak Ektar 100 color negative film, scanned with the Nikon Super Coolscan LS-8000 scanner. Brought to life with ColorPerfect. No further image adjustment, no colour changes, no levels, no sharpening. I think that´s pretty impressive technically. Perfect colours with no tweaking at all! The Sekor 180 Super shows really good resolution and sharpness, but to my eye the out of focus areas are a bit harsh. Perhaps I have been spoilt too much by the wonderful creamy yields of my DC Nikkors. This is a 100% crop of the above image showing the actual pixels at the usual 96 dpi screen resolution. At this resolution the complete image would be 228 cm or 90 inches wide. No sharpening applied to the scanned image. Not too bad, eh? The following sequence shows how the self-cocking device works with the 180 mm Sekor. An extension lever is provided on the lens barrel. You need to pay attention to its position when attaching this lens. It´s most easily done if the shutter is cocked before mounting the lens. Then you can hold down the extension lever to let it securely slip under the camera´s cocking device. Before the Sekor 180 mm Super was introduced, a somewhat simpler designed 180 mm lens had been in the game for years. As with the former chrome lens, even the later black one was labeled with the focal lenght given in cm instead of mm. Thus, this was the Mamiya Sekor 18cm. Here both 180 mm Sekors are shown side by side. The red “Super” logo easily distinguishes the newer one from the 18 cm Sekor. Note that my older 18 cm lens has a newer “blue dot” shutter cocking lever. This is indeed astonishing, because I have never seen any hint that even the newer Super Sekor was ever available with a blue dot. 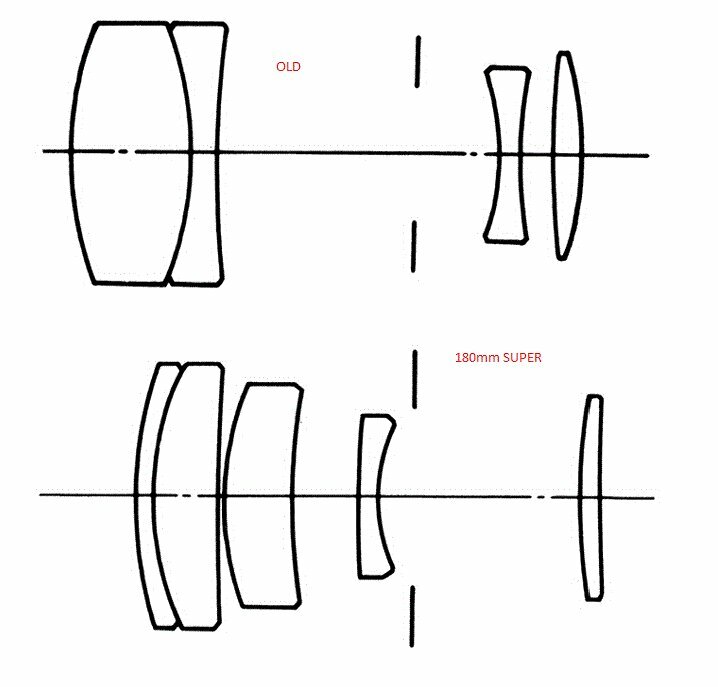 I doubt that the older lens would have been honored to be equipped with a newer shutter than the newer lens. Well, maybe. On the other hand, I have seen quite a few Sekors with blue dots in this vendor´s offers that are commonly thought not to have blue dot shutters. In his favor I may state that this 18 cm Sekor is in nearly mint shape, as are all his offers at the auction site. The older 18 cm Sekor (right) is a bit longer than the 180 mm Super. It has 4 elements with a very thick front element, while the Super Sekor has 5 elements. Both were only available with the “standard” amber coating. As you can see in the last two pictures, I have meanwhile managed to find a new 180 mm Super Sekor which is in pretty pristine shape, too. It really pays to have a certain degree of patience while scanning the auction site for Mamiya lenses. Every now and then a very good sample will surface, and if you are particularly lucky, the seller may have placed it in the wrong category, so competition will be weak. This entry was posted in Mamiya Sekor 180mm, Objetivo Mamiya Sekor and tagged Mamiya, Mamiya Sekor 180mm. Bookmark the permalink. Ante todo, gracias por tu blog y tus artículos. El enfoque más cercano de este objetivo es desde 129 cm. Yo entiendo que enfocando desde esa distancia a un objeto se obtiene una cobertura de 27,5 cm por 27,5 cm alrededor del objeto enfocado. Lo que yo tampoco entiendo es eso de 1 to 5. No veo que estés 100×100 seguro, pero tiene lógica. Puede que el visor no cubra el 100×100 de la foto ? A lo mejor es por ser la 220 y no la 330 ?